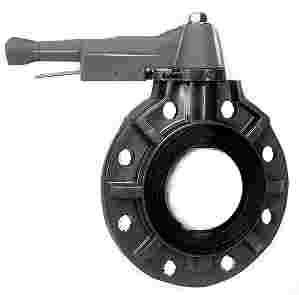 These Thermoplastic Butterfly Valves are great - They Don't Corrode. Lower initial cost compared to other valve types. Easier installation due to narrow face to face affords lowest installed cost. Designed to fit between ANSI D-16.5 Class 150 flat faced flanges. Strong, one piece molded body design. One piece standard S.S. through shaft for positive disc rotation and support. Standard polypropylene (PP) disc for higher (180�F) temperature service. Full body liner seat with integral flanges (eliminates the need for flange gaskets) ribbed for positive flange seating with minimum required torque. Standard PVC body and S.S. shaft are effectively isolated from the flow media by the full liner seat. Standard S.S., carbon steel plated, or epoxy coated external hardware for added corrosion resistance. 2" - 8" valves have spring loaded latch lever for positive disc positioning and shut-off. 8" - 24" valves have epoxy coated self-locking worm gear actuators for ease of operation and accurate flow control. Electric and pneumatic actuation packages available. Stem extensions, universal joints, floor stands available in a variety of materials.